Inflatable Wine Bottle Travel Bag - Moar Stuff - You don't need it but you know you want it. Can accommodate wine & spirits, olive oil, gourmet treats, breakable keepsakes, perfumes, camera lenses, toiletries, wet or soiled items, medications and more. I love to travel and I love to try local wines and spirits when away from home. However, I almost never buy any wine or liquor to take home because I worry that the bottle will get broken while on the return flight. Well the VinniBag solves my problem and let’s me bring some pretty good wine/liquor (and when I’m in Spain, olive oil) home from my trips. 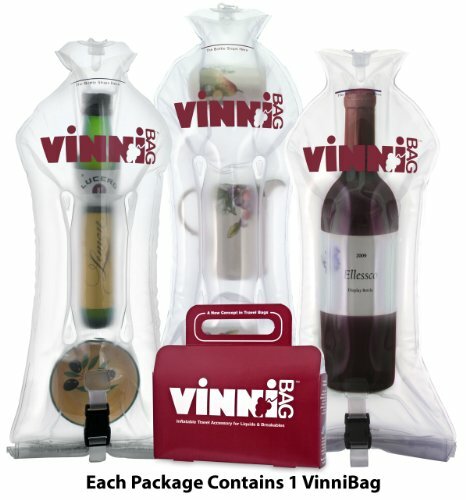 The VinniBag is an inflatable wine bottle travel bag that molds to the bottle (or souvenir or whatever) and protects it from damage. It has dual air chambers conform to the contents protecting against impact, leakage and shifting during transport. It’s made of very durable materials and is specifically engineered to withstand fluctuations in both altitude and temperature. To use it, simply insert your items, partially inflate with just a few breaths, roll up the bottom flap to form a liquid tight seal, and snap the buckle closed. Top off with air to suit your needs and space available. When you get home, just deflate it and remove your items. How easy is that? No special tools or pumps needed, just a set of working lungs. So, if you like to travel and you would like to bring some nice wine, liquor, or other fragile things home with you, give the VinniBag inflatable wine bottle travel bag a shot. Now, if you’ll excuse me, I have a wonderful Tempranillo from my trip to Spain last year that’s calling my name. Dimensions: 8.5 x 1.8 x 8 inches. Meets all TSA & airline requirements.